Bone loss is extremely common among individuals over the age of 30, and it can have severe consequences. It is estimated that half of women over the age of 50 suffer a broken bone as a result of bone loss. Many people who are experiencing bone loss aren’t aware of it. In fact, many cases of osteopenia and osteoporosis go un-diagnosed. Often times, an individual only becomes aware of it after suffering a serious injury, such as a fracture of the spine. It isn’t just women that develop serious bone loss. 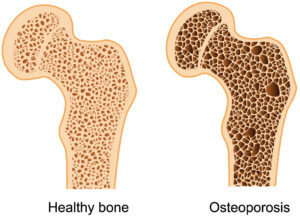 In fact, men experience osteoporosis and bone loss related fractures as well. In fact, men receive 20% of all osteoporosis diagnoses. Yoga is a powerful way to prevent bone loss. In some cases, bone loss has even been reversed by a regular yoga practice. One noteworthy case of bone loss being reversed by a yoga practice is the story of Gina Martin. She developed osteopenia in her 40s. However, this was reversed by stepping up her yoga routine in combination with a healthy diet. This is because the largest factor in maintaining bone density is the amount that muscles pull on bones. In many yoga poses, muscles pull extremely strongly on bones. In addition, yoga helps to train the bones to bear weight. For instance, many yoga poses involve bending the knee at a 90 degree angle to place weight on the bones of the leg. Studies have shown how yoga improves bone density. One study involved individuals with normal bone density. During this study, participants engaged in a 10 minute yoga routine each day. As a result, they experienced an 85% increase in bone density in the spine and hip. Yoga is designed to improve the flexibility of muscles. In addition, a series of yoga poses is designed to promote muscular flexibility throughout the body. This ensures that all of your joints are able to move as freely as possible. The increased range of motion can help you to better perform day to day tasks. For instance, as the muscles in the hip muscles become more flexible, it will become easier to pick up objects on the ground. Having more flexible muscles at the joints can also help to reduce your risk of injuries. Muscles can be injured if they are stretched more than they can handle. Unfortunately, these injuries can be quite serious. Studies have shown that yoga improves the flexibility of muscles. In fact, one study showed improvements in flexibility after only 10 weeks of yoga! In fact, some yoga poses have been studied for this purpose. Currently, a yoga inspired exercise is used by physical therapists to reduce the symptom of rotator cuff injuries. A yoga practice ensures that joints remain in motion on a regular basis. This helps to prevent cartilage from being lost. If cartilage is lost, significant problems with the joints can occur. Yoga helps to increase the amount of fluid in joints. The fluid in joints (synovial fluid) keeps them moving smoothly. Without enough synovial fluid, joints tend to grind. The grinding can cause joint pain and arthritis. Furthermore, there is no diet or medication that can increase the amount of synovial fluid in joints. Arthritis is a common condition that causes inflammation at the joints, and it can restrict joint mobility. Many people have minor forms of the illness without knowing it, but these minor forms of arthritis often become increasingly severe over the course of time. The condition can be crippling in severe forms. Not only is yoga beneficial for those suffering from arthritis, but some yoga programs are designed specifically for people with arthritis. Studies have demonstrated the effectiveness of yoga for arthritis sufferers. Yoga also is effective for other forms of joint pain. There are yoga programs that are designed for relief of joint pain that isn’t related to arthritis. Some yoga programs are designed to reduce pain in a particular joint. Scoliosis is often thought of as a condition that cannot improve, but yoga seems to have the ability to improve the curvature of the spine associated with scoliosis. In fact, a study showed that spinal curvature can be reduced with only one yoga pose on three days per week. The results were seen after only three months of this practice. Some common forms of exercise put a lot of strain on joints and bones, but yoga is specially designed to not overload the joints and bones. This helps to prevent injury. In addition, the progression of yoga poses is always gradual. This ensures that you don’t push your joints too far. Many types of exercise will become difficult to perform as you grow older, but there are numerous yoga poses that can be easily performed by people in their older years. This is a very good thing since many of yoga’s benefits on bones and joints are especially important in your older years.